Recently a group of New Zealand loggers went to Elmia Wood 2013, the world's largest forestry machinery exposition, held near Jonkoping in southern Sweden from 5-8 June 2013. There were over 500 exhibitors and 50,000 visitors attended. Future Forests Research (FFR) Harvesting Theme Leader, Keith Raymond went to the show and has highlighted some of the many innovations and new technology developments seen at the show in an FFR Harvesting Technology Watch report soon to published to FFR members. 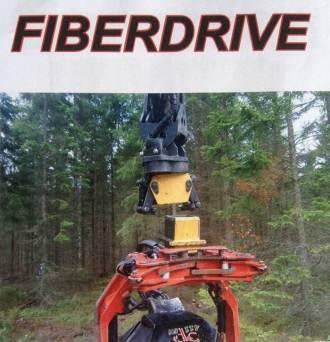 One amazing innovation seen at Elmia Wood was the Fiberdrive Quick Coupler attachment system for rapid switching from grapple to processor head. The unit was seen mounted on a SP Maskiner SP 561 LF harvester head and the operator changed from the processor head to a log grapple for loading trucks in a matter of seconds without leaving the operator cab. The Fiberdrive Quick Coupler attachment system allows the machine operator to rapidly switch attachments without leaving the cab, increasing safety and productivity. The system is a hydraulically braked link with a robust rotator (1800Nm torque) with eight hydraulic connectors, and one electrical contact for power supply. Power supply is via the quick release built into the mount. The hydraulic hoses are mounted in the centre of the rotator allowing rotation of 450 degrees. The system weighs 230kg and can handle a maximum attachment weight of 2200kg. It fits all rotators and is easy to install. Benefits are that all logging tasks (processing, loading, forwarding etc.) can be done with one machine. The speed of changeover from one function to the next was impressive without having to use a mechanic or leave the operator cab. The unit is manufactured by Fiberpac AB in Vislanda in southern Sweden, and is commercially available. More information is available from Jan Carlsson at Fiberpac AB, Bäckåkra SE-340 15 Vittaryd, Sweden, or email info@fibrepac.se. New technology developments such as this equipment may have application to New Zealand logging contractors and forestry companies. Small forest owners are also encouraged to attend these international forestry exhibitions as there is a lot of equipment for small scale harvesting and sawmilling demonstrated. The next major event showcasing new technology and innovations in the forest is the INTERFOREST forestry exhibition and show to be held in Munich in southern Germany from 16-20 July 2014. More information is available at INTERFOREST website.